Israeli elections are a week away and the two-state solution has largely been overlooked as a campaign issue. Tensions rise in Gaza as Israel and Hamas exchanged blows, now the sides seem to be closing in on a Egyptian-brokered ceasefire. The United States recognizes Israeli sovereignty over the Golan Heights, international community swiftly rejects. The Palestinian Authority face economic uncertainty as they refrain to accept Israeli tax payments after Israel cuts funds related to militant activity. New PCPSR poll shows rise in support for the two-state solution among Palestinians. These developments, as well as other events, ultimately moved the Two-State Index (TSI) down by 0.2%. Israeli elections are only a week away and the two-state solution has received little coverage with the only parties actively mentioning it being Meretz and Labor (at times). The leading Blue and White party, led by Benny Gantz and Yair Lapid, have "separation" in their platform but stop short of calling for the establishment of a Palestinian state and a two-state solution. 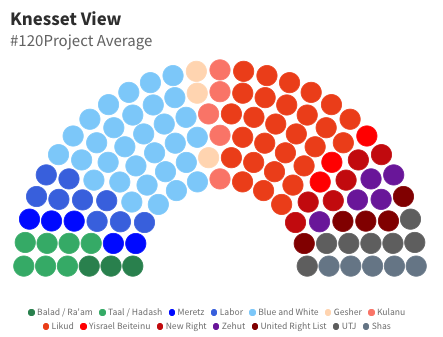 As we enter the last 7 days, Blue and White lead Netanyahu’s Likud by several seats, but the right-wing bloc still holds the majority of 61 seats or more. Nonetheless, the election results remain too close to call, with a Blue and White victory still possible. With a week left, Gantz and Lapid’s Blue and White will need to still rise higher in the polls and hope the balance of power between the blocs can shift in their favor. So far, the right’s lead in the bloc calculations make it more likely Netanyahu and the Likud will form the next government with right-wing partners. 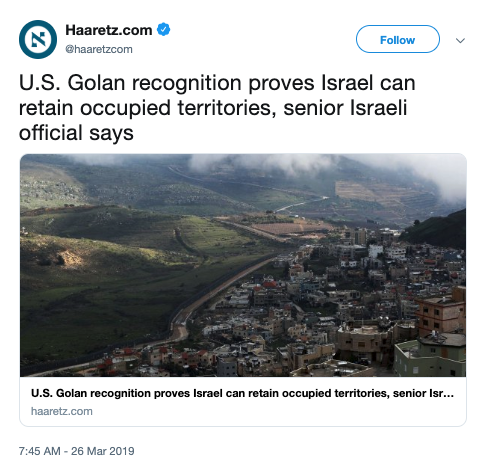 If this is the case, the government would have a solid majority of lawmakers opposed to the two-state solution and in favor of some form of annexation. What will likely determine who forms the next government are the smaller parties that pass the 3.25 percent electoral threshold. Over the last month, former Likud MK Moshe Feiglin’s Zehut party has surged and has reached as many as 7 seats in some polls. Feiglin has said that his party’s view on the Palestinian issue is similar to the Kahanist Jewish Power party. The upcoming election and uncertainty of who will form the next government leaves the relevant parameters dealing with Israel’s leadership of prime minister, government, and legislature unchanged at 4. Hamas quickly and brutally suppressed internal protests in Gaza last week with widespread arrests. Hamas rocket attacks on central Israel led to an airstrike retaliation from the IDF, including the bombing of Ismail Haniyeh’s office. The situation seemed to be escalating into a new round of large-scale hostilities but Egyptian intervention restored relative calm, for now. The 1-year-anniversary “March of Return” demonstrations took place over the weekend with relatively few violent events, which has enabled an agreement to have been brokered with Israel, to include reopening crossings; increase in Qatari funding from $15 million to $40 million a month; extending the fishing zone from 9 to 15 nautical miles; increasing the electricity supply from Israel into Gaza; and, approving a major desalination project. For a moment, the internal protest seemed to mark erosion in Hamas’s hold over Gaza. But the moderate Israeli response to the rocket attacks and the agreements that were subsequently reached are a victory for Hamas, and may very well calm the internal unrest. The emerging ceasefire/stabilization agreement in Gaza affects the relevant parameters: Governance from 3 to 4 and the Economy from 2 to 3. 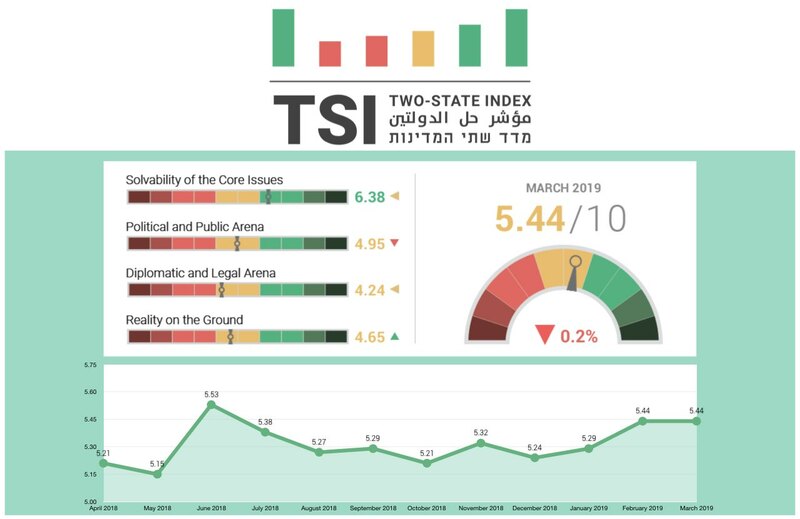 The security environment remains uncertain, but for the time being, we adjust the relevant parameters: Israeli and Palestinian attacks each move from 4 to a more relaxing 5, while Prospects for War remains at 6. The Palestinian Authority declared it would cease to accept any transfer for its tax revenues from Israel as long as Israel continues to deduct sums equivalent to those that are sent to families of prisoners and the deceased. This will leave the government with a monthly shortfall of around $190 million for the length of the crisis. The money makes up more than 50 percent of the PA’s monthly revenue. PA Finance Minister Shukri Bishara announced that PA salaries would be cut significantly — installing a cap of $550 — until the issue is resolved. The West Bank governing system is inching toward crisis. 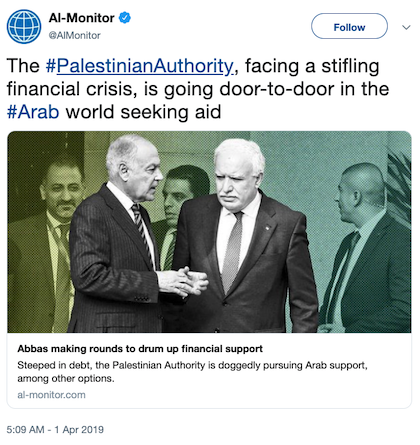 It is difficult to predict how long the Palestinian Authority can continue its functioning under these financial constraints. Estimates range up to six months, depending on how creative the Palestinian Authority can get given that traditional measures of dealing with a deficit — such as lending from international institutions or issuing bonds — are largely unavailable to it. On March 10 President Abbas asked Fatah Central Committee member Dr. Mohammad Shtayeh to form a new Palestinian government. Shtayeh is considered a political moderate, he is a strong supporter of the two-state solution and the creation of an independent Palestinian state alongside Israel. He was part of US-brokered negotiations with Israel in 1991 and again in 2013-14, led by US secretary of state John Kerry. Prime Minister-Designate Shtayeh announced that he will present the new government for approval to President Abbas next week after meeting representatives of various political factions, representatives from civil society, academia, previous cabinets members, youth and women representatives, private sector representatives and others. He discussed with the delegates his government program, which includes achieving national unity, preparing for legislative elections and strengthening the steadfastness of the Palestinian people in their homeland. This comes as a new poll released by the Center for Policy and Survey Research on March 19 shows rising support for PLO Chairman Mahmoud Abbas in comparison to Hamas leader Haniyeh and 38% approval of the appointment of Dr. Shtayeh. In addition, the poll suggests a rise in Palestinian support of a Two State Solution with 48% in favor (three months ago, support stood at 43%). The rise in support of the Palestinian Authority over Hamas does not account for the dynamics in Gaza (above). 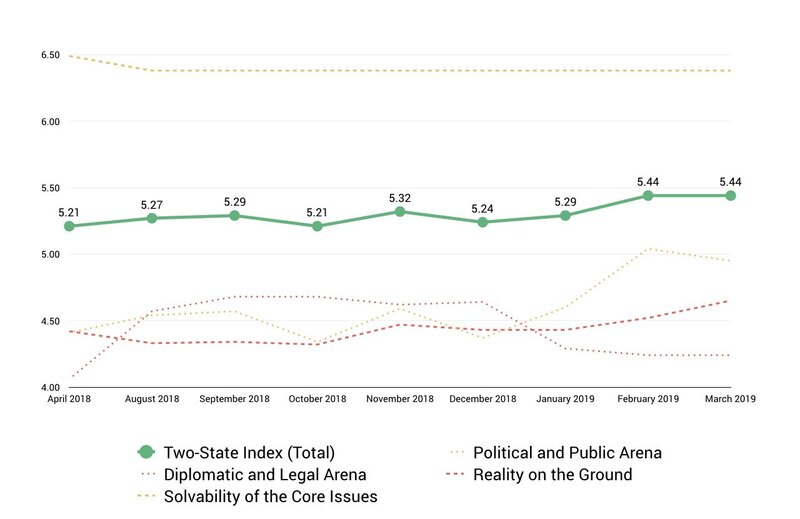 In the Palestinian Statebuilding category, measuring PA functioning in the West Bank, the two relevant parameters — Governance and Economy — stay at an alarming 3 and 2, respectively, while the increased support for the two-state solution bumps the Palestinian Public Opinion parameter from 3 to 4. In the United States, President Trump recognized Israeli’s sovereignty over the Golan Heights in what is considered by many to be a political gesture aimed to help Netanyahu in the upcoming elections. While an unnamed Israeli official was quick to hypothesize that this new American policy might apply to the West Bank as well, should Israel decide to officially annex parts of it in the future, US Secretary of State Mike Pompeo said that the case of the Golan Heights is ‘incredibly unique’ and does not apply to other cases. Trump’s statement came as Netanyahu was visiting the United States in order to speak at the AIPAC conference, the largest Jewish American event of the year. Notably, most of the Democratic hopefuls for the 2020 primary did not attend the event, highlighting the growing partisan divide in US-Israel relations. It is worth mentioning that the Center for Policy and Survey Research poll cited above found that an overwhelming majority of 83% believes that the Trump Administration is not serious about launching a new peace plan and 79% believes that even if the United States does offer one, it will not call for the establishment of a Palestinian state. As the United States becomes less of a viable option as a neutral broker between the PLO and Israel, these developments move the United States parameter from 3 to 2. The United Nations, European Union, and Arab League issued condemnation over U.S. recognition over the Golan Heights. Twenty-Eight EU members said the U.S. decision goes against international law as well as U.N. Security Council resolutions 242 and 497. The Arab League Summit in Tunis echoed this position. 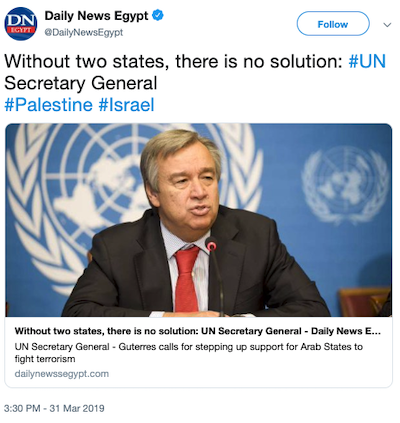 Addressing the Arab League, U.N. Secretary-General Guterres says a two-state solution for Israel and Palestine is "imperative." The EU, Arab League, and UN remarks, as well as their reiteration of their commitment to the two-state solution, reaffirm the high scores that both actors receive. Settlement expansion: Foundation for Middle East Peace's Settlement Reports. EU Six-Month Report on Israeli settlements (July-December 2018). By Tareq Baconi. Published on March 26, 2019. See full analysis here. In the early morning of 25 March a rocket fired from the Gaza Strip landed in Mishmeret, north of Tel Aviv, destroying a family house and wounding seven Israelis, including a twelve-year-old girl and two infants. The rocket launch came not long after two other rockets were fired from Gaza toward Tel Aviv, on 14 March, causing no injuries. Israel had responded to the earlier attack by bombing 100 targets used primarily for military purposes by Palestinian factions, as well as empty buildings, throughout the strip. The largest of those factions is Hamas, which took control of Gaza in 2007, prompting Israel to impose a blockade on the coastal enclave. The Islamist movement remains the de facto governing authority and, alongside other Palestinian factions such as Islamic Jihad, leads Palestinian military attacks against Israel. Despite the 14 March response’s scale, it caused no fatalities and four injuries. It appeared calculated to deter further rockets while avoiding an escalation between Israel and the Palestinian factions in Gaza. Israel declared that the rockets that landed near Tel Aviv had been fired in error. (Israel believes it maintains deterrence by proclaiming zero tolerance for projectiles coming from Gaza, whether launched intentionally or not.) Prime Minister Benjamin Netanyahu’s government appeared to prefer not to engage in another military campaign in Gaza, at least until after Israel’s 9 April elections. The rocket launched at Mishmeret seemed, at first, more likely to lead to a significant escalation, though no Palestinian faction assumed responsibility. For one thing, the mere fact that the rocket was fired showed that Israel had failed to deter factions in Gaza with its 14 March response. Secondly, the political pressure on the Netanyahu government to react powerfully was stronger this time because of the attack’s seriousness – this rocket travelled farther than previous ones and caused civilian casualties. Rocket fire at civilian centres, whether targeted or indiscriminate, is a war crime. Thirdly, the forthcoming elections, which served as a restraint on 14 March, provided reason to retaliate on this occasion, as the government wanted to demonstrate that it could restore deterrence. In a joint statement, [Hamas and other Palestinian factions] warned Israel that they would respond sharply to any escalation. Prime Minister Netanyahu announced that he was cutting short his trip to Washington, where he was scheduled to speak at the American Israel Public Affairs Committee conference and attend a White House dinner today. He promised to “respond forcefully”. His electoral challengers from the right had already criticised what they say is his past restraint in the face of rockets from Gaza. Education Minister Naftali Bennett, for instance, said Netanyahu’s reactions have “caused Hamas to stop fearing Israel”. Former Israel Defense Forces Chief of Staff Benny Gantz, who is Netanyahu’s main rival in this election, and is running from closer to the centre, similarly lambasted the prime minister for failing to respond “aggressively and forcefully” to previous attacks. Anticipating major bombardment, Hamas and other Palestinian factions went underground. In a joint statement, however, they warned Israel that they would respond sharply to any escalation. In the past twelve years, since the blockade was imposed, Israeli operations in the Gaza Strip, whether large-scale incursions or efforts to break up popular protests, have also entailed war crimes. Israel closed all the crossings into the Gaza Strip, called up reserves, including two armor and infantry brigades, and restricted sea access for Gaza fishermen until further notice. Hamas and Israel have been engaged in indirect ceasefire negotiations under Egyptian and UN mediation since July of last year. The talks produced a November ceasefire agreement: Hamas committed to end rocket fire into Israel and promised to restrain the intensity of the Great March of Return, the protests in the Gaza-Israel fence area that began on 30 March 2018. 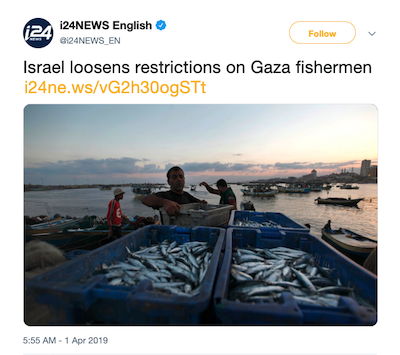 Israel in turn said it would extend the nautical limit for Gaza fishermen and agree to allow Qatar to pay Gaza government salaries and supply fuel to Gaza’s power plant. The parties agreed that after the immediate risk of escalation was averted, they would take measures toward a sustainable resolution of Gaza’s economic challenges. Yet while Hamas has demonstrated its capacity to restrain the protests, Israel has shown little willingness to advance the ceasefire beyond the initial agreement to allow Qatari assistance. Since November, the talks have stalled without progress toward fulfilling Hamas’s central demand – that Israel loosen the economic stranglehold on the strip. Hamas has long used rocket fire as a means of pressuring the Israeli government to return to negotiations and to grant concessions in Gaza. After the two rockets were fired at Tel Aviv ten days ago, the ceasefire discussions resumed. But, if rocket fire has been somewhat effective in bringing Israel to the table, it has largely failed to alleviate the blockade. From 14 March, the Great March of Return Higher Committee, which includes Hamas, expanded its “night disturbances” – whereby demonstrators blast loud noises and explode devices close to Gaza’s periphery in order to disturb Israeli civilians and generate pressure on the Israeli authorities. The latest rocket was likely an attempt by Hamas to force Netanyahu to choose between fulfilling Israel’s ceasefire obligations or suffering greater embarrassment among his political rivals and constituents. Hamas believes its hand is strong at present because the Israeli government wants to avoid an escalation ahead of the elections. In this sensitive period, Hamas assumes it has the best chance of pushing Israel to compromise without getting dragged into a full-scale war. Then there is the reality that Gaza’s economic straits are increasingly dire. The Palestinian Authority (PA) in Ramallah, dominated by Hamas’s main rival Fatah, is exacerbating the enclave’s plight by imposing sanctions as a means of undermining the Islamist movement’s governance. Sources describe the strip’s economic suffering as “unprecedented”, due to these restrictions, giving Hamas’s armed wing incentive to seek some means of alleviating the pressure. The rocket fire might well have been one such means. It is a very short-term strategy. As sources from Gaza tell Crisis Group, there is a widespread belief that a military assault on the strip is inevitable after the Israeli elections, given that all the main contenders are running on platforms that proclaim readiness to respond with force to similar provocations in the future. In the view of Gaza militants, the rocket fired at Mishmeret reminds the incoming Israeli government of Hamas’s military capacity and removes Israel’s ability to choose when to escalate. The idea appears to be that the rocket might provide urgent relief from particularly acute economic difficulties, gaining Gaza two weeks of respite and Hamas a bit of political credit. Furthermore, threatening to escalate at a time that is inconvenient for Israel, the factions believe, could enhance their negotiating power and undermine Israel’s ability to decide when the next war will be.